In her sixth spellbinding adventure, Carlotta Carlyle, the 6'1" redheaded P.I. from Boston, takes on a case that draws her into the mysterious shadova and of computer technology, where information is cheap, and privacy may be a thing of the past. Part-time cabbie Carlotta is entering the modern age of investigation. With the help of her sometime lover, mafioso, and computer-hobbyist Sam Gianelli, she invests in her first "hardware," a cheap personal computer. And at the urging of her ex-boss, Boston Police Lt. Mooney, who decries the stopping power of her .38 S&W, she decides to upgrade her arsenal. Both types of hardware come in handy when Carlotta is hired by Gloria, owner of G&W Cab, to investigate the brutal robberies that are causing her cabbies to quit in record numbers, and the violence and unanswered questions escalate. An explosion rocks G&W, killing Gloria's brother and seriously wounding co-owner Sam Gianelli. Is someone out to bankrupt G&W to acquire its invaluable cab medallions? Is the company a pawn in a Mafia vendetta, with Sam, the underboss's son, the target? And who put that tiny microphone near G&W's bathroom? Aided by a mysterious databank expert, Carlotta learns far more than she thought possible about "private" transactions. And she finds herself digging into Sam's past, exposing secrets he's kept hidden for years--secrets that begin to pull them further apart. As the investigation reaches its climax, Carlotta realizes, almost too late, that the mob may be just a fall guy in a very intimate crime. 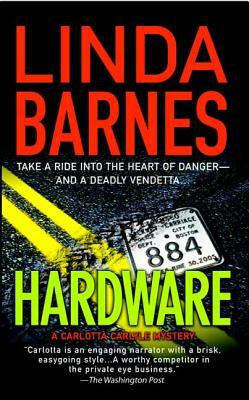 LINDA BARNES is the author of ten previous Carlotta Carlyle mysteries and winner of the Anthony and American Mystery Awards. She lives in the Boston area with her husband and son. "Ms. Barnes makes a fist and puts some muscle in this strong plot about an extortionist scheme to corner the market in the taxi medallions." "Warning, this is a difficult book to put down!" "One of the most sparkling and irresistible heroines ever to grace the pages of a whodunit!" " Barnes's knack for crisp, snappy dialogue and devising a mystery that has both timeless and contemporary appeal is a winner." "More than Grafton and far more than Paretsky - Barnes manages to overcome the too tough tendencies of her detective with salvos of self-deprecating wit..."